This isn't my bike. This isn't even my photo (it's via velospace.org). 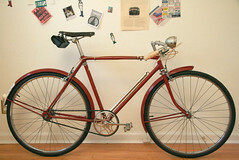 This is my vision for my latest acquisition -- a c.1967 Raleigh Sprite. The bike in the photo is actually a Raleigh Sports, c.1963, but the Sprite is essentially the same bike, but with a 5-speed hub, not a 3-speed hub (sheldonbrown.com). Later (and earlier) models of the Sprite had a dérailleur (boo). My bike is also a dark burgundy, not red like this one here. The restoration is in progress. I'll upload a photo once my masterpiece is complete.